Home » Ruth’s Blog » How to plant a bare root tree. How to plant a bare root tree. It is more economical to purchase a bare root tree and plant it in the winter. The tree is dormant. It has been lifted from the field, complete with its roots, while the weather is cold. You can transplant it into your garden and it will wake up in the spring and be happy to send down its roots and make a new home. 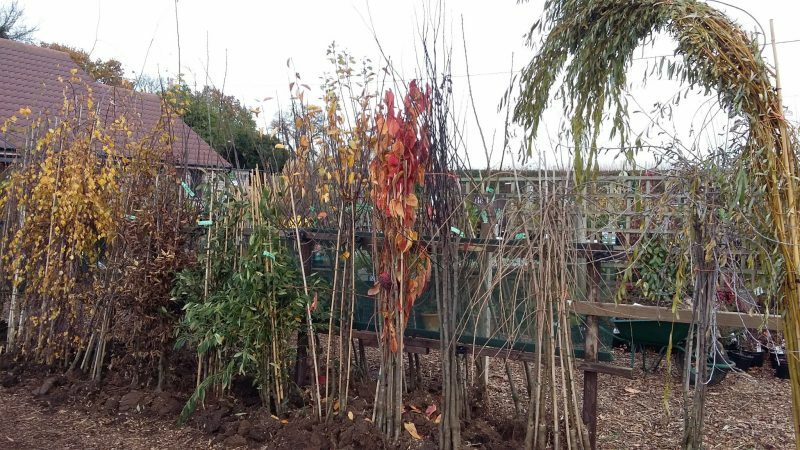 When you plant a tree in the winter it is with thoughts of better times – warmer weather, spring blossom and summer and autumn fruit. Make sure the roots do not dry out. If they do appear dry then place them in a bucket of water for a couple of hours before planting. Dig the hole. Make sure it is big enough for the roots to sit comfortably at the base. They should not be ‘squashed in’. Put in the stake. When you choose a stake make sure that, once it is fully erected, it reaches no higher than the lowest branch. Hold the tree in one hand then place the stake vertically in beside the tree stem. It will need to be about 8cm away from the tree. Drive it into the ground about 1ft below the bottom of the hole. By putting in the stake at this stage (rather than at the end) you can see that it does not damage any of the roots. Fill the hole. Use the soil from the hole to refill the hole but mix with plenty of well rotted garden compost or, if you do not have that, use multi-purpose compost. Put the first few spades of soil into the bottom of the hole making sure that it fills between the roots properly. One of the best ways to do this is to lift the tree slightly then place back down again before adding more soil. Fill the hole to the half way point then firm down with hands or boots. Fill the hole to the top and firm again. Fix the tree tie. The tie needs to be near the top of the stake. There are a variety of tree ties but you need to try to tie in a figure of eight so that one loop is round the tree and the other around the stake. Give the tree a good water. People plant the tree too low in the ground. Ultimately this will kill the tree. The tree needs to breathe from just above the roots. You can usually see a slight change in coloration on the bark from where the ground came up to before it was lifted from the field. Use this level as ground level again. People think that a tree can manage without water. Your tree will need water if we have a dry spring. Certainly you will need to water well through the first summer. In hot periods, when you water the tree, it is better to give it a real soaking twice a week rather than little and often. If you only water a little it keeps the topsoil wet but the roots to not get the moisture. This encourages the roots to rise to the surface and scorch. People forget to loosen the ties. As the tree grows so the trunk circumference will widen. If you do not loosen the tie it will cut into the tree. Also in high winds the tree will risk being snapped off if the tie is too tight. There needs to be an element of ‘give’. People forget to give the tree a good feed. Obviously it will depend on the soil but a feed of bonemeal is much appreciated in the first year to help the tree establish itself. This can be repeated every spring for good fruiting. In a world where we seem to be eroding the natural environment on such a grand scale it seems that by planting a tree we are personally making a promise to the future that we will try to make a change. Yet we do not need to wait for generations to pass before we enjoy the leaves, shade, blossom and fruit. Why don’t you get out in the fresh air and plant a tree today?